Ruta 3 in Argentina is boring! Before we started this trip we read a number of reports from overlanders who had followed a similar route. Most of them were enthusiastic about Patagonia. 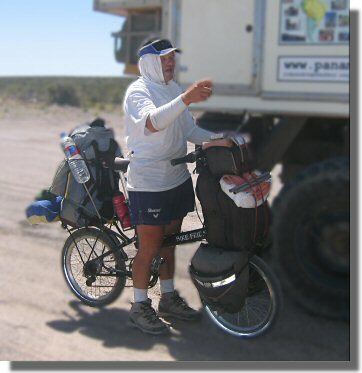 All of them failed to mention the mind bogglingly boring nature of much of Ruta 3 in Argentina. No mention of the long stretches of mundane, tedious, hum-drum, utterly forgettable, miserable, uninteresting, unattractive scenery. No complaints about the dreary, desolate, endless, monotonous, repetitive, dull, flat road. 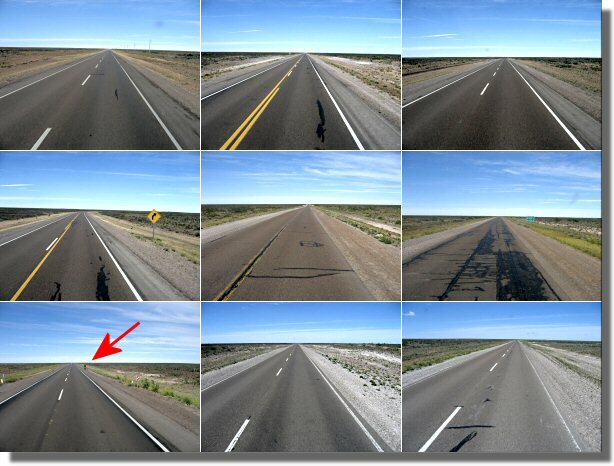 The photographs below show the highlights of a 200km section of Ruta 3 north of Comodoro Rivadavia . has been 44 years on the road. now rides a folding BikeFriday. carries 40 to 50 kg of luggage. has had 4 car accidents. has had 16 bike frame breakdowns. is the Guinness Book of Records: "Most Travelled Man in History". Although Ruta 3 is boring there are number of interesting diversions. One 50km detour down a dirt road takes you to the remains of a forest of large trees. The trees are well preserved with branches and growth rings clearly visible. However the trees are no longer wood, they were turned to stone around 150,000,000 years ago! The site warden searches each visitor as they leave to make sure no "wood" samples are removed.